Cook the rotini pasta in a large pot of boiling water until it is al dente. About 8 minutes. Drain and set aside to cool. Cut the bacon slices into 3/4” pieces and place in a large sauté pan set over medium heat. Cook the bacon until desired doneness, about 20 minutes. Remove from heat and drain on paper towel. 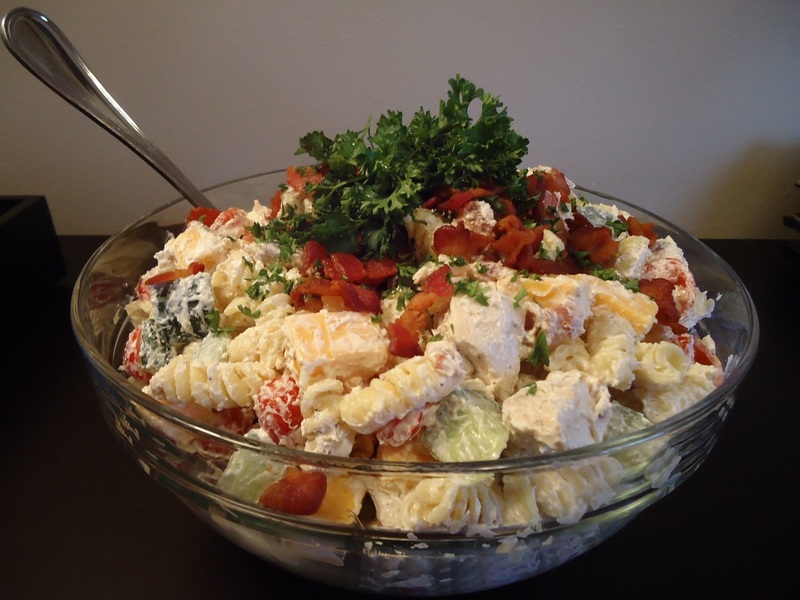 In a large bowl, combine cucumber, tomatoes, cheese, chicken, sour cream, mayonnaise and 1 ½ # of the chopped bacon. Add the pasta and stir to combine, seasoning to taste with salt and pepper. Refrigerate overnight and garnish with the remaining bacon and fresh parsley the next day.